I recently shared how I use skeleton outlines to write faster. In that post I shared an example blog post outline on the topic of "how to write fast." While I don't intend to actually write that article, I have touched on all of the techniques included there in other posts or podcast episodes. All of those techniques have been covered but one that is: batching projects and tasks. Batching isn't something I went out of my way to do. I fell into it naturally after years of running a business and tweaking my schedule to find out what worked best for me. And batching is pretty much the unsung hero of my career -- it's why I've been able to manage well over a dozen blogs at once, juggle that with freelance clients, and still find time to work on novels, short stories, and nonfiction manuscripts. So today, let's talk about task batching and some different ways it might be able to help you write faster and be more productive too. Task or project batching is simply grouping similar things together in your schedule. When you do this, you don't have to change your entire mindset as you move from one task to the next. And when you don't have to mentally change gears all the time, it's easier to fly through your to do list. You can think of it in terms of completing a jigsaw puzzle. You could dump all the puzzle pieces in front of you and pick up and try to place each of them one at a time in a sort of random order. Or you could do what many of us do -- separate the edge pieces out and work on the puzzle border first, then group other pieces based on their color, pattern, or anything else that suggests they belong in certain sections or groups. That would be batching. In the former method, you'd waste a lot of time and mentally bounce around from one area of the puzzle to another. By batching those pieces (or tasks in the case of your work), you can move much more seamlessly from one area to the next. There is no single "right" way to batch tasks if you want to improve your productivity. It all comes down to what kind of work you have to do. It helps me get through individual writing projects more quickly. It provides for a weekly structure that helps me get through work faster, writing or not. This is how batching helps me write faster. Here's how it might work. Let's say you're a blogger. You have a few client blog posts on your schedule this week, plus a couple of posts for your own blog. You could sit down and write each post one at a time, splitting them up across your work week. I outline all of the week's blog posts in one sitting. I do any research and take notes accordingly, again for all posts in a single work session. I flesh out those outlines in a single sitting as well (I can often get to this point in all of a week's posts in a few hours). Only then do I write the full drafts of each post. I usually write a few at a time, even if they're not the same posts that were outlined together (I'll often have a stock of fleshed out outlines ready to go when I have time to work on drafts). I'm much more likely to use this system for client posts on a weekly basis. But during some of my most prolific months on my own sites, this is how things get done. All of the outlining, research, and notes are handled ahead of time using batching. One solid day is plenty to prepare a month's worth of material so I can write much faster drafts whenever I need to throughout the month. You could do this with other types of work as well. For example, you might save all of your invoicing until the end of the week and knock it all out together. Or you might batch your social media marketing for the week, pre-scheduling as much as you can (not that that's the only social media presence you should have). Or maybe you would batch tasks like sending query letters to freelance writing prospects (after you've batch-researched all of those markets for that pitch session). Another way I use batching is to assign specific types of work to specific days each week. For example, most of the time I try to limit client projects to Mondays and Tuesdays. I use Wednesdays more for my own sites and blogs. And Thursdays are my admin and marketing day. That doesn't mean tasks never spill over. For example, if I don't prep a blog post for my own site the prior week, I may write a post on a Monday in addition to scheduled client work. I usually spend time on social media throughout the week (especially on days blog posts go live). And if a client needs a rush job and they contact me on Wednesday needing something ASAP, I may take care of it Wednesday or Thursday (though it's rare I take rush gigs these days short of urgent news that requires a press release or crisis consulting work). What this does is allow me to get into that single mindset I mentioned earlier. On Wednesdays, I know my head will usually be in blogging. On Thursdays I know I'll be dealing with all the boring crap I don't really want to do, so it doesn't interrupt my work flow on other days. If I need to schedule client calls, I know it'll almost always be early in the week. The only exception is my indie publishing work. That gets worked in whenever I can. Thursdays are usually fairly light work days, so I work a lot of that in then. If I'm working on a bigger manuscript, like a novel this month for NaNoWriMo, I'll set aside my first two hours or so of every work day to focus on that before I get my head into my more "normal" tasks. Again, it's all about batching. Instead of starting and stopping the novel work on and off all day, I get it out of the way and let myself focus entirely on the next task (or type of task) at hand. That's all there is to batching. It's a simple strategy for keeping your mind focused on one thing at a time. You can batch by days, or by project types, or by tasks within certain project types. Try it a couple of different ways and see what works for you. 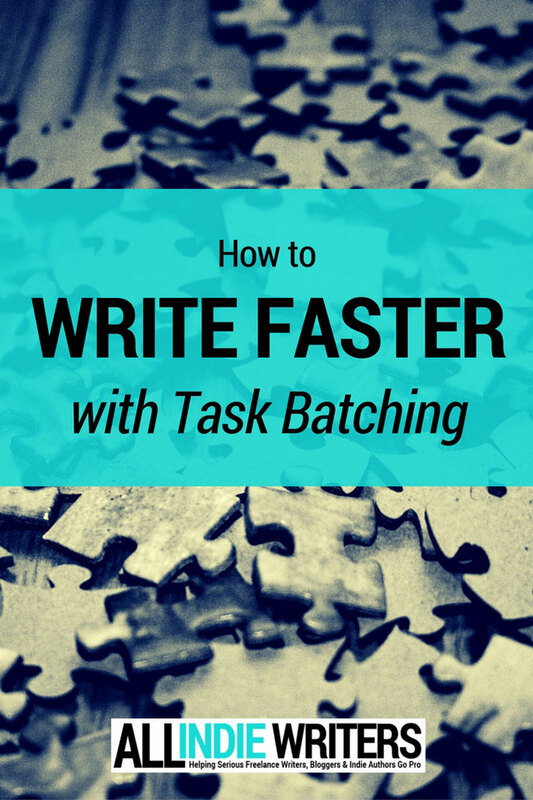 Do you already use task batching to help you write faster (or more)? How do you batch your work, and how has it helped you improve your productivity as a writer? I’ve used batching before though I typically have never thought of it by this or any other term. I’ll use a combination of the Google URL shortener, Feedly and Hootsuite, to advance schedule a few weeks of social posts. It’s very helpful, and I could probably benefit by using batching in other areas of my workflow as well. Thanks for posting. Jennifer, This is just the information I’ve needed for feeing unstuck with moving forward with a business. Thank you.